Successfully Added 7 Watt Bluetooth LED Light Bulb + Speaker - E27 Fitting, Android + iOS App, 350 Lumen, 6000K Color Temperature, Bluetooth 4.0 to your Shopping Cart. 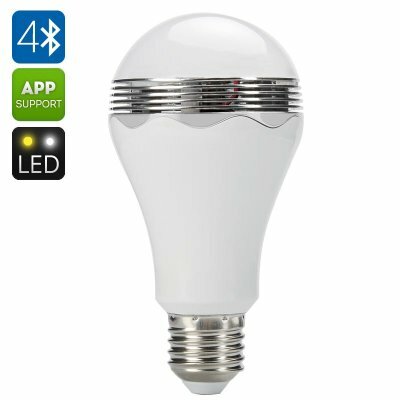 This energy efficient light bulb has a 2 Watt built in speaker and 5Watt LED RGB LED light that can all be controlled from your Android or iOS Bluetooth device. A total output of 7 watts means this light bulb uses a fraction of the power that an equivalent incandescent bulb would, and brings you 350 lumens of light. The RGB light can be adjusted as you see fit from the simple to use iOS or Android app. this gives control of the color temperature as well as the brightness while your phones music can stream directly to the light bulb. It makes a fantastic night light for your child’s bedroom and can be set to turn off after a predetermind time. Alternatively it can be used to bring some mood lighting to any other room of the house. With Bluetooth 4.0 you can stream your favorite music to the speaker and set the perfect atmosphere for any occasion. With a 50000 hour life span this low power bulb will last you years and more than pay for itself in energy savings. This LED Light bulb and Speaker with App control comes with 12 months warranty. Brought to you by the leader in electronic devices as well as wholesale LED lights, Chinavasion..